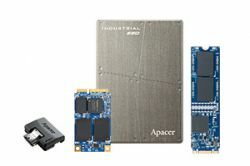 Apacer SM210-300 is a well-balanced solid-state disk (SSD) drive with compact form factor (JEDEC MO-300) and great performance. Designed in SATA 6.0 Gbps interface, the mSATA SSD is able to deliver exceptional read/write speed, making it the ideal companion for heavy-loading embedded or server operations with space constraints for host computing systems. For data efficiency, the internal controlling unit of the mSATA SSD is engineered with DRAM for enhanced random performance. In regard of reliability, the drive comes with various implementations including powerful hardware ECC engine, power saving modes, wear leveling, flash block management, S.M.A.R.T., TRIM, and power failure management.